Recommending a book that you can’t actually recommend. Fifty years after just barely repelling an alien invasion, the people of Earth are determined to be ready for the next and, if necessary, take the fight to their invaders. Their choice of soldier in this new world were wars are fought from cockpits and bridges of highly advanced spacecraft? Children. Enter Andrew “Ender” Wiggins, at tactical genius from the age of six who might just be the one to save the world. If he is willing to spend his childhood in simulators. I saw the movie version in theater and liked it enough to pick up the book. All in all, I loved this book. It was the kind of book I looked forward to reading whenever I got the chance. The story was compelling, had some good twists and some thought provoking themes, including the dangers of violent video games and the anonymity of social media (remember this book was written in 1985). The final concept in the book called “Speaker for the Dead” was, while not particularly plausible, a very interesting way to close up the story. So, why can’t I outright recommend this book? Straight to the point, the language is pretty rough. This is considered a “middle grade” book, which averages on 11-14 years of age. However, in attempt to portray children who are being forced into the toughest part of adulthood, the author added a lot of D— and H— and S-O-B, etc. to the extent where I don’t really understand how this book is classified as a children’s book. Okay, the primary characters are children. Is that really all it takes? Yes, I know there is a pretty big discussion right now about putting language of any kind in books. I would prefer not to have it anything I read, and I won’t put it in my writing. Frankly, I think it breaks the speech pattern up. Interestingly, Ender’s Game does portray cursing as how I’ve always described the way it sounds when people attempt it – Children attempting to sound like adults. I have my limits on what I will not tolerate. This didn’t cross my line. I’m not sure if that makes me desensitized, compromised, or just an adult. But I want to be honest and honestly know what you think. Is there a line for you between adult and children’s book? Are there lines that shouldn’t be crossed? Do you ever want to recommend a book, but are afraid to at the same time? Interesting side note: the movie is actually milder in language. 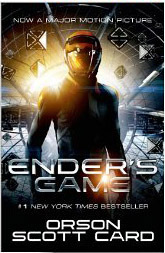 I don’t think Ender’s Game is a children’s book–everyone I’ve seen talking about it was over 18. It’s always tricky when a book for adults has a kid label or child characters, but the book tends to find its audience. The question is why some books, clearly for adults, have “kid” characters instead of adult ones. This is where the shelving and recommending headaches begin! This is a dilemma, and one I’ve come up against on occasion. Like you, certain elements can make or break my recommendation. In this case, I guess some would argue that the language is realistic, and while I understand that, I don’t want it in something I read. I certainly don’t want my kids to have a diet of it either. What we feed our minds is what will come out in one way, shape, or form. I find certain use of dialects and other items such as strong language interrupt the flow of the story for me. I’m not saying stories like this don’t have their place, just not sure what that balance should be. Appreciate your thoughts on this! Good point, Karen! What goes in, does come out. ;) I feel like this would be a better book for parents, because it does focus heavily on the result of children playing violent video games, or having un-monitored internet access. And I agree, while there could be a case made for realism, it isn’t really necessary. Considering how much I liked the story, I would have loved to be able to freely recommend it. Oh, and I have been in similar pickles with books. I reviewed a book recently that I felt nervous about reviewing for similar reasons. I was also nervous I would be judged for reading, and enjoying (with caveats), the book. I think standards have changed. I loved A Series of Unfortunate Events, but I was really surprised at the subject matter that they touched upon and the number of deaths that occurred. I don’t remember adultery, drinking and murder in books when I was 11 years old. ;) That being said, I find MG books are more intelligent that a lot of YA books I read. Strange world, books.